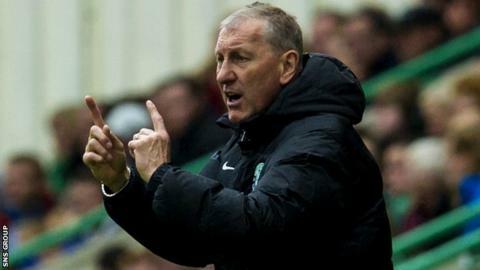 Terry Butcher is in the frame for a return as Motherwell manager as Ian Baraclough emerged as another candidate to land the job. Butcher, 55, sacked by Hibernian in June, has been interviewed as the club seek a replacement for Stuart McCall. And ex-Sligo Rovers manager Baraclough has also spoken to the Steelmen. Among the other interviewees are former Kilmarnock boss Kenny Shiels and Dutch duo Mitchell van der Gaag and Rob Maaskant. Former England captain Butcher was in charge of Motherwell for four years before leaving for Sydney, while the two Dutchmen played for the Steelmen in the 1990s. Van der Gaag, 43, has managed at Portuguese clubs Maritimo and Belenenses. Maaskant, 45, who was most recently an assistant at Columbus Crew, has coached in his native Netherlands as well as Belarus, Poland and the United States. Shiels has been out of work since leaving Morton in May, resigning his post after a 10-2 defeat at Hamilton. Baraclough, 44, has had spells in charge of Scunthorpe and Irish outfit Sligo. "It's a really attractive proposition for any manager. It's a good club, it's a family, community-orientated club. It's a good environment for managers." Caretaker Kenny Black, who was McCall's assistant, has overseen one victory and three defeats and will be interviewed - along with one other candidate - with the club aiming to make an appointment before Saturday's Premiership match at home to Ross County. The Steelmen, runners-up in the last two seasons, are currently in 10th place in the league, two points above bottom side County. Butcher was sacked seven months into a three-year contract at Hibernian following the Easter Road club's relegation via the play-offs. He had previously enjoyed success at Inverness Caledonian Thistle and took Motherwell to the League Cup final in 2005, having steered the club through a troubled period following administration. General manager Alan Burrows said on Saturday the club had been "very impressed" with the two candidates spoken to on Friday (Butcher and Van der Gaag). "We'll speak to another couple at the start of next week," he told BBC Radio Scotland. "At that point the board, hopefully, can sit down, go through them, make the decision and the aim is to try and have something sorted out before the Ross County game in a best-case scenario. "We spoke to two people and both interviews were absolutely excellent, very encouraging. If nothing happened on Monday, we'd still feel confident we could have at least a decision between two so that's how good it was. "We had 58 serious applications for the jobs - all weird and wonderful names, some really distinctive, some not so much - it was a really difficult process even just to whittle that down given how many good candidates and how many strong candidates, many with experience in very senior leagues in world football. "It's a really attractive proposition for any manager. It's a good club, it's a family, community-orientated club. It's a good environment for managers. There's a platform for a good manager to come in and do really well here, both for himself and for the football club." As well as their managerial situation, Motherwell are also in the process of a potential takeover. Fans group the Well Society has been trying to raise enough money to buy former chairman John Boyle's majority shareholding and Burrows said: "The club are in discussions with a number of people, one of them's at a very advanced stage. "Unfortunately, there's not too much I can say. I'm bound by confidentiality given the advanced nature of the talks. What I can say is that we're hopeful of a positive solution very soon. "If we get to where we want to be, the fans, I think, will be quite satisfied and quite happy with the way it's going to go. "Hopefully, it'll be done very soon and we can get back into a real structure at the club." Read more on Motherwell keen to appoint new manager "as swiftly as possible"